[Matt's Messages] "My Dear Friend Gaius"
I invite you to turn in your Bibles with me to the third epistle of the apostle John. The book we call Third John. Or as they say in England “Three John.” It’s at the back of your Bible, two books away from Revelation. If you get to Jude, you’ve too far. If you’ve found 4th John you’re reading the wrong Bible! How many here have ever heard a sermon on 3 John (that they can remember)? How many have ever read 3 John? How many read it this week? Some of you did. I did. Some of us are using a Bible reading plan that had us read 3 John on Thursday this week. How many are still reading through the Bible in hopes of pancakes in January? That’s awesome! There is still plenty of time to read the whole Bible by December 31st, even if you start today. Just take 8 chapters a day, and you’ll more than make it. So, I was going through my Bible reading this week (‘cause I want pancakes, too! ), and when I read 3 John, I immediately thought about our graduates. The sermon series on money still needs time to bake in the oven–Lord-willing, we’ll start it officially next Sunday–and I’ve been looking for what in the Bible to preach on today while that’s still getting ready. I could preach on prayer, as it is the Global Day of Prayer. I could preach on the Holy Spirit, as it is Pentecost Sunday. But, as I was reading 3 John, I saw several points of truth that the apostle John was sharing with his dear friend Gaius that I thought was worthy of sharing with our dear graduates. And they are all things that all of us need to hear. So 3 John it is. 3 John is a personal letter from the apostle John (He calls himself “The Elder” meaning, I assume that he was an elder in the local church and was older and wiser in the truth–a letter from the Apostle John) to his dear friend Gaius–who appears to also be a leader in a local church that John knows about–perhaps that John planted. It’s very short. One chapter. It would have all fit on one piece of papyrus. 3 John is a personal letter, but it obviously was meant to affect the local church that John cared about and that Gaius was a leader in. And eventually, it was circulated as part of Holy Scripture–part of God’s holy Word for us today. It’s obvious just by reading it that Gaius was John’s dear friend. V.13, he hopes to see him face to face. He sends greetings and peace. John loved Gaius. He loved him in the truth. He was dear to him. A dear friend in Christ. And out of that love for Gaius, John wanted good things for him. Look at verse 2. And Graduates, that is our prayer for you, as well. That you would enjoy good health and that all may go well with you, even as your soul gets along well. There is a desire here for both physical health and spiritual health. And we want both for you, too. We want blessing and prosperity and peace and health and spiritual growth for all of you. John loved Gaius, and he loved getting a good report about him. Look at verse 3. #1. WALK IN THE TRUTH. It appears that some brothers (and possibly sisters) in Christ from Gaius’ church had been visiting John wherever he was, and they brought back a report that Gaius was walking in the truth. He was (v.3) faithful to the truth and continuing to walk in the truth. And what did that do for John? Now, Gaius was probably not John’s physical son. He may have been John’s spiritual son. John may have led Gaius to initial faith in Christ. We don’t know. Regardless, John felt a paternal love for Gaius and others. And I know that we think of you Graduates as our children, as well. As the children of the church. And we have no greater joy that to hear and know that you are walking in the truth. That’s how I feel about you, as well, church! I know that I’m young enough to be many of your sons. But as your pastor, I also sometimes feel like your father. And I have no greater joy in ministry than to know that you are walking in the truth. Well, it starts with knowing the truth. The truth of the Bible. The Bible is full of truth. It isn’t just an ancient document that is irrelevant to our lives today. It is the very truth of God. And to walk in the truth means that we must know what it says. I’m excited that so many are reading their Bibles in 2009! We’ve got to keep feeding ourselves the truth. Since January, I’ve been heating our house with an outdoor wood burning furnace. We fired up the wood furnace for the first time on January 7th. And I thought that the salesman said that it would go 24 hours between feedings. And he did, but that’s in the Summer when it’s hot outside. It can go 24 hours now in late May. But in January, it can go about 12 or 14 hours. Well, it’s the first week of using it. I filled it up on Thursday night at 5pm and went all night and got up in the morning and didn’t put anything in it (‘cause it can go 24 hours! ), and I get into the shower, and brrrrrr! It was cold! I go out to the furnace–open it up. And guess what I saw in the firebox? If there is one thing you don’t want to see in your firebox, it’s icicles! What was the problem? I wasn’t feeding the fire its fuel. Bible is the fuel of truth for the fire of the Christian life. I’m afraid that for many of us, if God opened up the firebox of our lives, He’d be looking at icicles! We’ve got to feed our hearts with the fuel of God’s truth in the Bible. And more than that, we have to burn it. We have to live it out. That’s why John says to WALK in the truth. Not just to know the truth. To know about the truth. To have lots of information. But to WALK in it. He’s talking about living out the truth. Applying it to our lives. Graduates, God wants you to know His truth and then to apply it to your life. To integrate truth with life. So, every day, we need to ransack this book for truth and then not just agree with it, but to set the course of our lives by it. This applies to every area of our life. Everything in our life relates to the truth. Walk in the Truth. And it will GOD no greater joy! Now, here’s specifically what was Gaius was up to. He was using his home for hospitality to support traveling missionaries. He knew the truth of the gospel–the forgiveness of sins in Jesus Christ, and he knew the need of the world to hear the gospel, and the need of missionaries for support in getting the word out. #2. WORK TOGETHER FOR THE TRUTH. V.5 again. I think what’s going on here is that Gaius has been opening up his home for traveling missionaries. He’s feeding them, giving them shelter, a stopping point, and probably some money for the next leg of their journey. They are both brothers of his and strangers to him. That is, they don’t go to his church. He’s never met them before. But they are gospel brothers in Christ, and so he’s helping them. Gaius had a heart for the mission. Graduates, have a heart for the mission! You know that the Lord has given us a mission, right? We are on a mission. We are to make disciples of all nations in the Name (v.7) of Jesus! And whatever we do in life, we are supposed to be faithful to the mission of Jesus Christ. That might mean “going.” You should be open to the Lord’s call on you to go into career missions. But it also might mean staying and supporting and sending. That’s just as needful in our world. God is calling many people to take up full time jobs right here, not just to provide for their families but to provide for reaching the world with the gospel of Jesus Christ. Working Together for the Truth. What are you doing–what are you going to do–to advance the mission of Christ? Graduates, what are you doing? No. It’s your mission, too. I love the fact that Amber has put on here that she wants to go to Africa someday on a missions trip. I pray that that would happen. But all of us right here, right now can be involved in this mission ourselves. Giving, going, sending, supporting, praying, caring, writing. Be faithful to the mission of the gospel. It’s the greatest news in the world. The news about a Savior who has come to rescue sinners from ourselves! Jesus Christ paid the penalty for our sins so that we don’t have to! He died on the Cross and then came back to life to give us life! And all who turn and put their trust in Him will be saved! That’s glorious news and we need to get the word out. That’s our mission. And to build people up in the truth. To make disciples of Jesus Christ. We all need to be faithful to the mission. We are in this gospel ministry, together. I think that’s part of the point of the Global Day of Prayer. Praying for the whole world–together–that many would be reached with the gospel. Gaius was doing it by opening His home. We all need to figure out how we can work together for the truth of Christ. #3. WATCH FOR GOOD EXAMPLES OF LIVING THE TRUTH. Here’s a problem person: Diotrephes. He was gossiping. That’s a major sin in the Bible. He was refusing to welcome the brothers (like these missionaries we’ve been talking about), and he was even putting people out of the church who wanted to support missionaries and have fellowship with the apostle John! Why? Why did he act like that? It’s an inordinate desire to be honored, to be first, to be number one. Diotrephes had it bad. And the whole church suffered from it. Unfortunately, I’ve had it myself many times. It’s bitter and not helpful to others. John is going to have to confront it when he visits this church. And here’s where John goes this with this. Find good examples to follow. Don’t imitate Diotrephes. He’s got a disease. It’s a disease that plagues America, but it’s a disease to flee from. Now this is not saying that anyone who ever sins isn’t a Christian. That’s not what he’s talking about. He’s talking about a settled pattern of life. Diotrephes might be orthodox, but he’s not walking in the truth. And if that describes, that characterizes, your life, then you can have no assurance that you have truly seen and known God through Jesus Christ. Jesus didn’t put Himself first. He put us ahead of Him at the Cross. And that’s how we’re supposed to live now. Graduates, put other people first in your life. Find a career path where you can serve others. Don’t just find a job that feeds you money. Money is good. We’ll talk about money all Summer. Money is good–especially for supporting the mission! But money is not good at just feeding our desires. We need to put other people first. Notice the emphasis on truth. Truth, truth, truth. Walking in the truth, working together in the truth, and watching for good examples of those living out the truth. I think that John is contrasting Demetrius with Diotrephes. Do not imitate what is evil (Diotrephes) but what is good (Demetrius–everyone agrees that he’s good–we do, even the truth does!). Notice that it’s right to follow other people. To imitate other people. It’s natural and normal for us to have heroes, leaders, examples–people that we aim to be like in some ways. Now, we shouldn’t want to be clones. But we are supposed to see what is good and right and helpful and wise and loving in someone else (a hero), and strive (by faith) to be like them. My Dear Friend Gaius, watch Demetrius. He’s doing it right. Follow him. Graduates, you should have heroes. In fact, I’m sure you have them. The question is are they godly? Are they more like Diotrephes or Demetrius? Is your hero one of the bad boys of the NBA or the NFL? Or they are self-less Christian athletes who don’t get all of the same press, but are worth following? Or is your hero someone in your career field who makes tons of money but spends it all on themselves. Or someone who works hard but is generous? We all have heroes. The question is whether they are Diotrephes or Demetrius. John the Elder wants us to watch for examples of those who are living out the truth. This room is full of them. Grad, if you are looking for heroes and examples, you can’t do much better than what’s right here. But wherever you find them, find them! Watch for Good Examples of Those Who Live out the Truth. John wants to say more. I want to say more. ∙ And Watch for Godly Examples of Those Who Live Out the Truth. Only 1 More "Sleeps" Left! Yesterday was a great day of hanging around home. We didn't need any babysitters. In fact, we had other kids come over and I "babysat" them! We played baseball, read books, ate good meals, made plans for Mom's return, and even cut wood for the winter. Today, we go to church, baseball, and make preparations to get Mommy back here! Yesterday, the kids played, made crafts, and ate at the home of another dear saint in our church, and then they fed me too! And then it was 5 episodes of Pink Panther (see a pattern here?) and another camp-out in the basement. Hooray! I got the bulk of my work done (including the sermon) yesterday, so I'm free to stay home and play with the kids today--all day--no babysitters! Having fun and looking forward to Mommy's return at the same time--the best of both worlds. Now we're on the right side of this waiting game! Hoping to finish the sermon today so that I can spend the whole day with my kids tomorrow. Tonight, we cross the middle from 4 to 3. Almost half-way there! Had a good day today. "Aunt" Judy took the kids most of the day, and then we had a spaghetti supper watched some Pink Panther and went to bed. Yesterday, thanks to "Aunt" Judy went very well (Thanks for two meals and babysitting!). We had a good day, did our dentist thing, and camped out in the basement. Only 5 more nights to go until we get our Mommy back! Mommy is away visiting her Canadian family. Last night was the first of 7 "sleeps" until she comes back to us. Yesterday, we all (the 6 of us and Heather's parents) went up to Miracle Mountain Ranch for their annual Open House. We didn't make any of these pictures, but we did many of the things you see--including pony rides for the boys! A great time. Then it was back home, water the garden, feed the chickens and the fire (not feed the chickens to the fire! ), and off to bed. Today, it's work, play, visiting with friends, and a 4 kid dentist visit and then off to bed again--for fun, we're all going to camp out together in basement, not in our rooms. And then only 6 more sleeps until Mommy returns! I’d like to take you to a delightful and revealing story in the gospel of John. It’s kind of like a play. Heather and I love to go to the theater. One of our favorites is the Sawmill Theater at Cook Forest State Park. Every weekend over the summer, local community theater groups come in and do plays. We love to go. The theater there is really neat. It's enclosed, but the walls are on hanging tracks so that they can open and you really feel like you're outdoors. The breeze comes in. We've been there on nights when bats come in! The stage juts out into the middle of the floor so that you have “theater in the round.” No seat is more than, say, 25 feet from the stage, so there are no bad seats. And when there is a good play, we love it! We like to watch the characters interact with one another, unfold a plot, tell a funny story or a sad story. We also like to grade the actors afterwards. Do you do that when you watch a play? Who was the funniest, or who was the best at keeping a straight face? Who had us eating out of his hand? Who was the best actress? Who could really sing? Which one stole the show? We love to replay the action in our minds as we travel home. Sometimes we watch a really meaningful play and one of the characters is struggling with something that we are going through. It might be grief or it might be joy. It might be a character trait that we have recently recognized in ourselves. It might be an aspect of our personality. Or it might be a situation that a character has gotten himself into that rings true in our experience. You know what I’m talking about? This morning, I want us to think about John 9 as a play. It’s a great true story with lots of little twists and turns. It’s one of my favorites. There are several characters: Jesus, the disciples, a man born blind, the man’s neighbors, the man’s parents, and the Pharisees. This morning, as we walk through each scene, I want you to ask yourself: “Which character do I most identify with?” Which character sounds like you or describes you? Which character looks like you, acts like you? Which one are you like? Which character (or set of characters) are you acting like in your life right now? The curtain opens on Act 1, Scene 1. Verses 1-7 Let's read them. The first scene is the story of the miracle itself. A man who had the congenital birth defect of blindness is healed by Jesus. This man is never named in this chapter but almost all the action revolves around him. He has never seen anything. Think about that! Life has always been dark for him. He's never seen a person or a tree or a building or the sea or the sun. He was born that way. He has never seen anything. Rightfully they make a connection between disease and sin. Disease comes from sin. But not all disease and sickness is the result of specific sin. You see, Adam and Eve and our rebellion as humanity introduced all the pain and suffering that we experience in life, but it is not always a one for one occurrence. His parents didn't sin so that he was blind. And he certainly did not sin in the womb so that God punished him with blindness–that's not how it works. Ask Job. Jesus explains it in v.3. Jesus says that the disease that this man has did not come from anybody's direct sin. Don't let people put guilt trips on you by telling you that your illness or handicap is because of some unconfessed sin in your life. That is not always true. This man had a whole other reason for being blind. Specifically, that God's glory, God's activity would be displayed in his life. Sin wasn't even part of the picture here. Now, because Jesus responds this way to his disciples here, I think that the best word to summarize the disciples in this story is foggy. They were asking all the wrong questions. They were misdirected. Their focus was off. They wanted to get their theological questions all answered (their i's dotted and t's crossed) when God wanted to do something miraculous. They were focusing on the problem and not on Jesus’ intentions and solutions. They were foggy. And at the end of scene 1, Jesus demonstrates in a physical way, that spiritual truth–that He is the light of the world. Jesus approaches the man (can you see it?). He hocks up a big loogey, He spits on the ground. He grabs the dirt and rubs His hands in it. He makes a mud pie with His saliva. And then He sticks it on the man’s eyes. Dirties them all up. Eeyh! Many people have wondered why he did this. He uses mud-salve a couple of other places in the Gospels for healing miracles, too. I don’t know. I suspect that it had something to do with showing himself to be God because of what kind of life he can bring from the dirt. Remember, what we saw last month–we all come from the dirt. And breath from God's mouth and dirt from the Earth formed our bodies. Maybe Jesus is making some kind of a statement with that. I’m not sure. It doesn't seem to matter much here except that it makes the man need to wash it off and leave Jesus to do it. So the man has this mud on his face (can you see it? ), and Jesus sends him to a place named the Pool of Sent where he washes the mud and spit off of his face. And then, he can see...for the first time. Suddenly, this man knows what people really look like. What water looks like. Can you imagine? As he’s brushing the water from the pool of Siloam from his eyes, he catches his own reflection in the pool. He feels his face and watches his fingers touch what he sees. He can see for the first time! He lifts his head and can see Jerusalem–people bustling by on their business. He can see. And He makes his way home. End of Scene 1. This man’s old home is the setting for scene number 2. When the curtain opens on scene 2, Jesus is no longer on stage. In fact, Jesus disappears from the action until the last scene of this story when He comes from offstage to deliver the most important concluding lines. But the dialogue through these scenes have everything to do with Him. OK. The dialogue in scene #2 is very short, simple, and to the point. Basically, they just figure out that this man was indeed the man who was a blind beggar and establish the simple facts of how Jesus healed him. Well, that calls for some attention. The curtain closes and then opens right again as the man's neighbors bring him to the Pharisees. This healing deserved some attention and some comment by the religious authorities. Now this story is starting to get sadly funny. It’s funny, but it’s sad. In this interrogation, the Pharisees assume that Jesus must have been up to no good. They do not believe what they hear. Now, it appears that their opinions were not universally held, there is some division going on among the Pharisees. Some were amazed at the miracle and began to wonder if, in fact, Jesus was the Messiah. But for the most part, it’s the same old story with the Pharisees. Here before them, is a man who never could ever see and now is blinking at them with wonder in his eyes that “that is what a Pharisee looks like? Wow!” He's overbrimming with joy in his new-found ability to perceive the world and is sure that anyone who did this to him must be a prophet from God, but they are stuck on the fact that Jesus did this miracle on the Sabbath. Work on the Sabbath was forbidden. You were not to allowed to be kneading in the mud, You were not allowed to apply a healing salve. You were not to heal something not life-threatening on the Sabbath. That was against their customs (the additions to added to the Law). So, they reasoned, there's something fishy about this story. There's something we're not hearing. We need to investigate this further. Notice, they have no regard for the truth. They are only seeing things through their pre-conceived notions about Jesus. And, in fact, no proof will change their minds! Scene 3 ends with them shaking their heads in disbelief. If the word that describes the disciples was Foggy, the word that best describes the man's parents is Fearful. Pharisees had begun to spread a fear in Jerusalem among those who might believe in Jesus. And that fear had reached this man’s parents. They had heard that if you acknowledge Jesus as Christ, you would be forced out of the synagogue–basically excommunicated from their religion. They were fearful of persecution for Jesus' sake. Fearful. And scene 4 ends with them pointing a quaking finger back at their son. First they drag him, then they throw him out! Do you see how twisted they are? This is a great way to witness. You can’t hardly argue with a personal testimony like this. If you're trying to communicate your faith to someone who isn't really searching for truth, use your personal story–how Christ opened your eyes. They're disgusted and disbelieving. They can't believe that they have to put up with this. Remember. This man has been healed of blindness. Blindness from birth. And instead of recognizing God's activity, they are doing everything they can to discredit Jesus and His followers! The man (we don’t even know his name!) puts it on the line for Jesus. He tells it like it is. Unlike his parents who were paralyzed by their fear, he boldly says that he believes that Jesus is from God. He counts himself as one of Jesus' disciples. And he gets insulted and thrown out on his ear for it. He will not be welcome in the synagogue again. He is an outsider now with Jesus. On the first day he can see, one of the first things he sees with his new eyes, is angry faces and the shut door of excommunication. Scene 5 ends with the man seeing--but seeing himself thrown out and all alone. And that’s when Jesus comes back on stage. In scene 6, Jesus finds the man and makes him His follower. This guy finally sees the Man who healed him. He looks into His eyes. And Jesus introduces himself as the Son of Man, the Messiah, the one sent from God to bring sight–the Light of the World! The disciples, in this story, are characterized by fogginess, the parents by fearfulness, but the man by Faith-filledness. This man believes, and he worships Jesus! He believes! And he kneels down right there and worships him. Faith leads to worship. This man had put his neck on the line for and now he fully believes and worships Jesus. He was filled with Faith! All of this has been leading up to something. Sometimes at the end of the play, you get the moral of the story. Well, our main character, the hero Jesus, gets the honor of delivering that line of bringing the point–in one last speech. All of this healing from physical blindness was to prove a point about spiritual blindness! Spiritual blindness is the inability to recognize truth–specifically the truth of who Jesus is. Truth with a capital T. When you are spiritually blind, you are lost. You don't know the way. You may think you are groping in the right direction, but you are in fact, lost and without hope. But. But what if you don't follow him by faith. What if, after listening to His message and checking out His claims, you don't believe? Jesus says that then you will walk in darkness. Then you will remain in your guilt. Then you will stay spiritually blind. And that's what Pharisees did and that's what the Pharisees were. They are the “Blind Men” I am referring to in the title of this message. The disciples were Foggy. The parents were Fearful. The formerly blind man was filled with Faith. The Pharisees, however, were Stubbornly Blind (I'll bet you thought it was going to start with an F!) Stubbornly Blind. They chose not to believe. They chose blindness over the light. “For judgment I have come into this world...” In other words, everyone takes a side and is found to be on one side or the other. “...so that the blind will see...” In other words, those who admit their blindness and come to Jesus by faith will be given spiritual sight. They will be able to recognize the truth. And what does Jesus say? The Pharisees were stubbornly, resistantly blind. They chose blindness. They wouldn't admit to their need for light and for healing. And Jesus left them in their blindness and their guilt. Stubbornly blind. Refusing to ask for healing and help. And the curtain falls. Now. We’ve watched the play–all 6 scenes. It’s very dramatic. Amazing and surprising and funny and sad all at the same time. The audience applauds. You put your snack in the trash on the way out. You file out of the theater, get into your car and head home. It’s time to talk about the characters. First, Jesus. Wow. So powerful. So wise. So mysterious. He healed a man who had been blind since birth–where else have you heard of anything happening like that? What an amazing character! He is voted best actor. Best character. The neighbors didn't say enough to really comment on. They were just one-sided characters to get across some of the facts. But of the other characters. Which ones did you identify with most? The disciples? Foggy, misdirected? Are you stuck on some theological point or question and you're missing the power and reality of Jesus' activity in your life? Is your focus kind of foggy? Maybe you’re focused on your problems–and not on doing God's work while it is still day-light? Does that sound like you? I've been there. I've been foggy. I’ve struggled with it this week! We need to ask Jesus to clear away our fog. We need to not see all sickness as the result of some specific sin and not get caught up in theological questions with no purpose. Jesus wants us to concentrate on His reality and activity in our lives through a love relationship with him. And He wants us to be busy doing His work. How about the parents? Fearful. Does that describe you? You don't lie about Jesus. You just don't say anything about him. You're concerned about appearing cool and normal. You're afraid of what your friends will think of you if you come out strong for Christ. I've been there. I've been fearful. In fact, I'm afraid that the parents are the characters that I most readily identify with in this story. Last week on vacation, we were at a gift shop, and I saw that the man behind the counter, who was very nice and sociable was reading Christopher Hitchen’s book, “God is NOT Great.” Which is a book stridently arguing for atheism. Well, what do you think I did? I got scared! I knew that I should say SOMETHING to this man. He was definitely loving the book. And it will mean his damnation if he doesn’t turn and come to the Truth–the Light of the world. But I was sure tempted to be like the parents in this story. I kept running various sentences over in my mind of how I could bring up the subject of Jesus, but I also kept fighting inside myself–fear. At the end, I swallowed a gulp and shot up a prayer, and suggested another book for this guy to read that gave the other side of the story. That was it. But I did it. I overcame my fear enough to speak up at least a little. Fear is not from God. We have not inherited from him a spirit of fear but of power, and of love, and of discipline. We need to ask God for boldness. He loves to give it. But refusing to ask for help means remaining in your guilt. God wants to give you spiritual sight. To give you the new ability to recognize truth. Specifically recognizing the truth of your lostness and how to become found. Specifically recognizing the truth of who Jesus is–the Savior and Son of God. But if you don't, you won't. He allows you to wander blindly over the waiting cliff. I've been there, too. I was blind spiritually. But I don't want to go back. Jesus has healed my spiritual eyes. I now have the ability to recognize truth. I can see the Way now. Don't stay there. Don't be a blind man. Come with those of us who know Jesus and know what He can do. You could say this phrase, too “I was blind, but now I see.” Don't stay at stubborn blindness. Turn from your sin today and trust in Jesus for salvation. He will heal your blind eyes. I hope that some of you chose the man who was blind, this morning, as the character you most identify with. He worshiped Jesus in the presence of Pharisees. He counted the cost and became a disciple of the one who healed his eyes. Is your life characterized by faith and worship? That's what we need. We got back Wednesday afternoon from our Spring Vacation with Heather's folks. 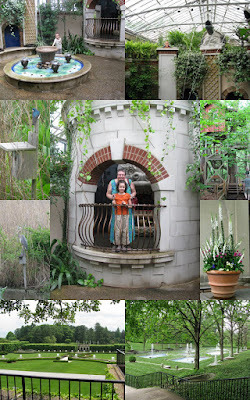 We enjoyed visiting my aunt and uncle, Longwood Gardens (most of the pictures are from there--they have a really neat Children's Garden), Fort Mifflin (what a great Revolutionary War story!) where we saw someone fire a musket and a cannon, a friend's wedding, worship at Sovereign Grace Church in Cherry Hill, New Jersey, lunch and visiting with one of the pastors of that church (old friends), the Cape May Ferry (which we caught by the skin of our teeth! Thank you, Lord! ), and a couple of days at Rehoboth Beach, Delaware. I got to finish 7 books while we were away--a mix of readings for class, sermons, and mystery novels. Great to be away, and great to be back. Drewby is playing baseball! You wouldn't know it from this picture (the first in his new uniform), but he's learning a lot and having a lot of fun. At his first game, first time at bat, Drew got a hit. This is picture is just a second before he connected with the ball. He got to first base. And then his teammates batted him HOME! [Matt's Messages] "A Christian Mother's Labor Is Not In Vain"
This is our fifth and last message in our Resurrection Month–that started back on Resurrection Sunday in April. We’ve been working our way through 1 Corinthians 15–the Resurrection Chapter–and we get the climax and application this week. 1 Corinthians 15:50-58 is a passage that is read at many funerals. I read it at just about every grave-side service that I conduct. But today is not a funeral. Today is Mother’s Day! A day when we thank God for and honor our Mothers. Especially all of the hard work that they do for us. Their labors of love for us. Our mothers went through “labor” to give us birth. But their “labors” didn’t stop there. Did they? And every one of us should be thankful for the hard work that our Moms have done for us. Changing diapers. Chasing kids around. Swatting bottoms. Handing out medicine. Cleaning, cooking, cleaning, cooking, cleaning, cooking, cleaning, cooking, cleaning, cooking, cleaning, cooking, cleaning, cooking, cleaning, cooking, cleaning, cooking, cleaning, cooking, cleaning, cooking, cleaning, cooking! Thank you, Moms, for the hard work you have done and are doing for your kids! Guess what is the application of this last paragraph of the Resurrection Chapter? It’s in the last sentence (v.58). “A Christian Mother’s Labor Is Not in Vain.” 1 Corinthians 15:50-58. For the last five weeks, we have listened in as the Apostle Paul tried to fix the problem at Corinth of a group of people in the church who denied the resurrection of the dead. He has reminded them that they used to believe in a resurrection; he has shown them that Christianity cannot stand without Christ’s resurrection; he has pointed out to them the guaranteed benefits of the resurrection; he has exposed the uselessness of suffering for Christ (or even being good at all) without the resurrection; and he has demonstrated the utter foolishness of denying God’s creativity and power to accomplish the resurrection which He has planned. And now here, in vv.50-58, we have the climax of Paul’s words. These are glorious words! V.50 picks up where last week left off. Last week was all about our new bodies being like seeds. Remember? You don’t plant an oak-tree, you plant an acorn. Our bodies now are mere acorns compared to the oak-tree bodies that will be ours when Jesus comes. Our bodies now are perishable, dishonored, weak, natural, and sin-bearing. Our bodies then will be imperishable, glorious, powerful, supernatural, and spiritual. We have, so far, lived in dust-formed bodies like Adam’s, but soon we will live in transformed bodies like the Risen Lord Jesus Christ’s. And what Paul wants to get across in this first section (vv.50-53) is the necessity of this transformation. The “resurrection transformation” is not an option. It is a necessity. It is a must. It is a need. 1: TO GET INTO GOD’S KINGDOM YOU NEED A NEW BODY! Look at verse v.50. Do you see the point? You cannot go into the coming kingdom of God like you are right now. Everyone here is flesh and blood. You and I have an Adam-like body. But our natural bodies are not suitable for God’s kingdom–the new heavens and the new earth. Just for example, look down at your hands for a second. Your hands are a marvel of God’s workmanship in design. He is a master-craftsman. But your hands, as they are now, will not be good enough for the kingdom of God. They will not be appropriate for the new earth. They are perishable. They are dying, decaying, falling apart, corruptible, temporary. They are not what they were supposed to be because of sin, and they are almost nothing compared to what they must be to enter the imperishable, eternal Kingdom of God. “Flesh and blood cannot inherit the kingdom of God.” The perishable cannot inherit the imperishable. You need a new body. The transformation to a resurrection body is necesssary and essential. So essential, in fact, that ALL must go through it to enter the kingdom. That’s the point of v.51. “Listen, I tell you a mystery: We will not all sleep, but we will all be changed...” Stop there for a second. Paul reveals a mystery. A mystery is something that was once hidden but is no revealed. Paul reveals that there will be a generation of Christians who are alive when Jesus returns. [And I hope that it is our generation!] And that generation WILL NOT DIE (He says, “We will not all sleep”). But [get this!] that generation that is alive when Christ comes, must be transformed, too! Let me put it this way: Those who are alive when Jesus returns will get a resurrection body even though they have never died! It’s that important! When we are talking about resurrection, we don’t just mean simple resuscitation; we don’t just mean reanimation; we’re not talking about Zombie-life, we don’t just mean the near-death experiences that we read about in the tabloids. We are talking about total resurrection transformation. Our bodies must be transposed to the key of imperishability or they cannot play the tune of the kingdom of God. That’s what must happen to us so that we can inherit the Kingdom of God. And it will happen, for those who belong to Jesus and are alive at His coming, instantaneously. V.52. The last trumpet is the heavenly signal that the End of Time has come. And in a flash, Paul says, in the twinkling [or the blinking] of an eye it will all be over. The dead will be raised with transformed bodies. And the saints who are alive will be instantaneously transformed, too. Do you look forward to that day? Do you live in anticipation of that Resurrection Day? This is what we are supposed to be living for. We are content to look forward to our next vacation. Or to the weekend. Or to our next paycheck. Or to our next meal. This is what we are to be living in anticipation of! This is what we are to talk about with one-another. In other words, these are the kind of words that should encourage us. They should be on our tongue with one-another when we are comforting or challenging or praying for one-another. This is what we are supposed to be living for! Just this week, one of our elders was in my office encouraging me to emphasize the End Times in our preaching ministry. He was saying that we need to constantly remind ourselves of what is coming–so that we are living for Jesus in light of His return. Do you hope sometimes that Jesus won’t return soon? Do you hope that you will get married first? Do you hope that you will raise children first? Do you hope that you will get out of school first? Do you hope that you will get that new car or bike first? Do you hope that your business gets off the ground first? I have felt that way before. But if we hope like that that Jesus won’t return soon, then it shows that our hearts do not understand the wonderful transformation to glory that God has planned for us. He is with us now spiritually present. But then, we will see Him face to face! Let’s live in anticipation of His coming! When we get a new body that will enable us to be with the Lord forever. That’s why we need a new body–to enjoy a love relationship with Jesus Christ throughout all eternity, forever and ever and ever and ever and ever and ever and ever. Amen. V.53. To Get Into God’s Kingdom You Need a New Body! And He’s got one ready for you. #2. TO GET OVER YOUR ENEMIES YOU NEED A GREAT VICTORY. V.54. Here is the glorious anticipation of our greatest enemy’s defeat. It comes from Isaiah 25. It is the death of death itself. Remember, death is the “last enemy” according to v.26. You and I need to be reminded that we have powerful, awful, deadly enemies in this life: the world, the flesh, the devil, and worst of all–death through our sin. And these enemies have conspired to take us down forever and ever into unending torment and pain and suffering. Jesus Christ has fulfilled the law. Jesus Christ has paid for our sin. Jesus Christ has dealt the decisive death blow to death itself. And one day, all of our enemies–including death–will be completely vanquished! I think that we’re supposed to get this mental picture of death falling, falling, falling into the mouth of victory. Death is seen no more! Death is swallowed-up in the jaws of victory in Jesus. Paul is so excited in anticipation of this coming triumph that he begins to taunt death. “Where, O Death, is your victory? Where, O death, is your sting?” You don’t have it anymore. “You’ve lost, Death. You are a loser!” Christ has given us the victory! Praise God! Do you praise God every day for your salvation? The cross and empty tomb of Jesus Christ mean that death will not triumph over you. You have a great victory over all of your enemies! Christian moms, I know that you feel the force of your enemies against you–the world, the flesh, the devil–and the last enemy–death. But you have a great victory overcomes them all! Unless maybe you are here this morning, and you are not yet a follower of Jesus Christ. Death IS your enemy, and, without Christ, it will defeat you. You have sinned and fallen short of the glory of God. The law of God powers your sin to show its sinfulness. You have earned the wages of sin which is death. Jesus Christ has wrought a great victory over sin and death. He died on the cross to pay for your sins, and He has risen again to give new life and new bodies to those who will (in total trust) bow the knee before Him as Lord, right now. Don’t let another second go by without trusting Jesus. He wants to be your Savior and your Lord. Turn right now in you heart from your sin and trust in Him. And Jesus will save you and include you in this ultimate victory over death itself. Christians, do you have victory in your battles with sin right now? V.57 says that Jesus “gives us the victory...” That’s present tense. Not just that He gave us the victory, but He is doling it out right now. He gives us grace to have victory over our sin. We need to receive that grace and live by that grace every hour of every day. To Get Into God’s Kingdom You Need a New Body. And God has one planned for you! And To Get Over Your Enemies You Need a Great Victory. And God has supplied [and is supplying] a great victory for you! To Get On With His Work You Need an Unbeatable Hope. You have a transformation to look forward to into an imperishable, glorious, powerful, spiritual new body. It is guaranteed by the resurrection of Jesus Christ and His overwhelming victory over every one of your enemies. We can’t lose! We can’t lose! We can’t lose! It’s an unbeatable hope. What can stand against it? Absolutely nothing! Now, you might be wondering what this really has to do with being a Christian Mom. It has everything to do with being a Christian mom. It has everything to do with anything we do as Christians! Change that next diaper. Even in the middle of the night.Fix that next meal. Discipline that child for their defiant behavior. Yes, again. Tell your kids about Jesus one more time. Hold out to them the grace of the gospel. Pray them through their trials. Take them to that next game. Wash that next load of laundry. Open the Bible with them at bed time again. Give that loving parental counsel once again–even if they aren’t going to listen. Don’t give up, Christian Moms. The work of the Lord is not just what I do as pastor of a church. It’s what you do as a Christian mom. Give yourself fully to it. Don’t give up. The same is true for all of us here. What is God calling you to do for Him? ∙ Teach a Sunday school class? ∙ Be a witness in the marketplace or at school? ∙ Love an unbelieving spouse? ∙ Defeat some God-belittling sin in your life? ∙ Endure the hardships of Christian parenting? ∙ Plan a men’s ministry event? ∙ Do your job at work with excellence as unto the Lord? ∙ Share your faith in Jesus with an unsaved friend? ∙ Step out in faith into a new ministry area? ∙ Persevere in prayer for revival and spiritual awakening? ∙ Go to a “hard place” as a missionary? Do it! Do His work because you can’t lose! A Christian Mother’s Labor is Never in Vain. And neither is the rest of our labors. Paul says, “Stand Firm. Let nothing move you.” Don’t get caught up in false teachings that deny the resurrection. And don’t get caught up in the things of the world. Set your mind on things above. And then get busy with God’s work for you. Because you can’t lose! What’s the worst that can happen to you if you are doing the work of the Lord? You might die and not see the fruit of your labors. So what? God will raise you from the dead and reward you for your labor in Christ! Nothing you do for the Lord will be in vain! So what if God calls you to the mission field and you miss out on pay raises, and vacations, and retirement? We have an unbeatable hope. We should have unstoppable ministry. Death is defeated for us. So we should be powerful in our ministry for Him. We are far too easily stopped by the prospect of apparent pain and loss. So often, we rationalize our complacency in ministry–including parenting–because of something we want to gain, but we will lose absolutely nothing if we follow Christ because we have all eternity in resurrection bodies to enjoy His rewards! So get out there and do His work! Get busy! The word behind “always” and “fully” is “perisseu,onte.” It comes from the same word I demonstrated by pouring water into and over that glass that one time. Our lives should overflow with ministry because we have an unbelievable, unbeatable hope in the victory of Jesus and new bodies on the way. Stand firm, Christian Mothers. Let nothing move you. Always give yourselves fully to the work of the Lord, because you know that your labor in the Lord is not in vain. We can’t lose. It is worth it. It will always be worth it. Heather and I will mark 15 years of marital bliss on June 18th. We've got such a busy Summer planned that we decided to celebrate it early (and over my birthday!) with a getaway to our favorite place on God's green Earth--Cook Forest State Park in Clarion, Pennsylvania. THANK YOU to all who babysat for us (we had a 4-unit team to get us through the 2 nights away) and to Bob for the loan of his truck! We hiked each day of our getaway. This was our longest hike. We alternated taking photos at each trail sign. For those of you who know Cook Forest, you have a good idea of how long our hike was (not obvious from the pictures here), where we were, and what we saw. We stayed at the Gateway Lodge--comfortable and fun! A great anniversary to mark a great marriage. Praise the Lord! Heather took this one on my birthday along the trail in Cook Forest. It seems more like me than the old one. Anything is better than this one. These are the garden boxes that are Heather's Mother's Day gift this year. They're not just full of dirt. Heather has all kinds of seeds ready to plant. Purple, white, and blue; fragrant. T.J. Addington reminds us to leave the past in the past. Al Mohler talks about a movement that is unintelligible to the world but beautiful in the church. I've witnessed a couple of these, and it's awesome! Josh Perry links to a great list of ways to live missionally right where you are planted. We’ve been learning that there was a major problem at Corinth. Some of the professing believers at Corinth denied the reality of the resurrection. They were teaching in that church that true “spirituality” did not involve the body. And once you died (you might continue on in some ethereal disembodied state (who knows?) but that your body would not live again. But that is not a Christian way to think. That teaching is not truth. That is a major heresy. A major problem that leads to all kinds of other problems. And all of The Resurrection Chapter–1 Corinthians 15 is devoted to fixing it. Second, Paul explained to them that Christianity is futile if there is no resurrected Jesus. That’s what I told my hitchhiker. Vv.12-19. Third, Paul burst out with a description of the blessings that Jesus’ resurrection has secured for those who believe. Vv.20-28. Fourth–what we saw last week–Paul told them to not even bother with baptism, or suffering for Christ, or being good and moral at all if there is no resurrection. Vv.29-34. Just eat and drink and sin away if this is all there is! And now today, in verses 35 through 49, Paul calls those who scorn the resurrection, “FOOLISH” and explains why they are fools to deny it. The first verse of our passage needs to be read with a little bit of a sneering ridiculing attitude that mocks the resurrection-deniers at Corinth. V.35. #1. HOW FOOLISH TO SCORN THE RESURRECTION. And that’s what they were doing! If they weren’t talking with scorn in their voices, Paul probably wouldn’t have been so harsh back at them. But he calls them “foolish” to talk like that. They were scornfully denying the resurrection. In the day and age that you and I live in, people have so much faith in their scientific answers for everything that resurrection is an unintelligible category for them. They deny it without even trying it out as an idea. And they miss the most important aspect of it–resurrection is from God. We are not talking here about simple resuscitation. We are not talking here about mere re-animation. We are talking here about God’s plan for total resurrection! Not Resuscitation, Not Re-animation, Resurrection! That’s why Paul calls them fools. A fool is someone who does not factor God into the equation. Granted, without God, resurrection is silly. But if God is real, and God says that resurrection is the plan, we better sit up and take notice! And Paul scorns them as foolish because they did not see God in it. “How foolish!” He says. And then he explains why. We can split his explanation into two parts. The first is in vv.36-44. #2: HOW FOOLISH TO DENY GOD’S TRANSFORMING POWER AND PLAN. V.36. “How foolish!” You obviously have not factored God into your equation! Now follow this. Paul begins by arguing from something they all know about: seeds and plants. An integral part of God’s creation. He says, our bodies right now are like seeds. Seeds have to die (they get plucked off of a life-giving plant and buried in the ground). And then God changes them (transforms them) into something very different. For Mother’s Day this year, I helped Heather build two garden boxes. They are 4 foot by 4 foot and 16 inches high. Don’t look too closely at the workmanship! But Heather is happy with them. This weekend, I shoveled 2½ tons of topsoil into them for her to get started with her planting. Do you think she planted a great big stalk of corn in there yesterday? No, she put in little tiny seeds. You don’t bury an oak tree; you bury an...what...acorn. You don’t bury a big live plant; you bury a seed. You bury something small, fairly ugly and “dead,” and then you get something tall, beautiful, and very alive. Catch this. That’s how God has designed this world. And it’s like how He’s planned the next. And God is very creative about it. V.39. Paul is saying that God is very creative! And God is very powerful! And if God can make bodies that have feathers for flying, and fins for swimming, and fur for keeping warm, and DNA for passing on genetic code, then He can prepare a new resurrection body with new properties. If God can make rivers and ravines, moon rocks, and sunfire, and stars with varying colors and sizes and qualities, then God can certainly raise up resurrection bodies that are suitable for heavenly living. Do you see that? To deny that is to deny God’s transforming power and plan. Someone who says, “I don’t understand how it could be.” doesn’t understand the first thing about God. God is so creative. And He is so powerful. He can do whatever He wants. And He has planned a transforming resurrection. Get this, folks, even if I am missing you on all these other points, the new body that God has planned for you (if you believe in Jesus) can be identified with the one you are presently in (there will be a “kernel of continuity” with your present body), but your new body will be significantly changed, significantly transformed. God has a plan, by His power, to transform your body into a Resurrection Body. Your body is a seed. And there is a kernel of continuity between what you are now and what you will be then. The same you! But you will also be transformed. I think many Christians don’t think about the resurrection at all. They only think of dying and going to heaven–as if the intermediate heaven that is right now is the new heavens and new earth that are to come. But a disembodied experience is not our future! Our bodies are seeds to be planted and then transformed into a glorious new plant. And starting in v.42, Paul gives us a preview of what that transformation will be like. Whoa. This is some good stuff. Now remember, you and I in our bodies are seeds. And unless we are part of the generation present when Christ returns [...And I hope we are! More on that next week! Unless we are a part of the generation alive when Christ returns...] then we will all die. We will be seeds that are sown, buried, put in the ground. But that will not be the end. God has more power than that. God has more planned than that! #1: (v.42) We are sown perishable. That means dead, decaying, corruptible. My hair is falling out, my biological clock is ticking down, slowly (sometimes faster than others) I’m falling apart, perishable. But when I am raised, I will be imperishable. God’s plan for me includes an undying, undecaying, incorruptible body! Wow! #2. (V.43) We are sown in dishonor. Right now, our bodies die in dishonor (often gasping for our last breaths, all of our dignity gone). But then, our bodies will be raised in glory (no suffering; no sign of the corruption of age; bright, shining, new, glorious bodies). I think the point is that they will reflect God’s glory in ways that our present bodies don’t come close to. We will be raised in glory. #3. (V.43.) We are sown in weakness. Our bodies die in weakness (you realize that no one ever dies strongly, right?!). But then, our bodies will be raised “in power.” God’s power. The power of a new, indestructible body. You and I can’t imagine the qualities and properties these new bodies will have! Power! And #4. (V.44). We are sown in a natural body, we will be raised in a spiritual body. Now, that does not mean that we are physical now and immaterial then. It means that our bodies are natural now and are going to be supernatural then. We die in a body that is fitted or suitable for natural living in this created order. We will be raised in a body that is spiritual, fitted, and suitable for living in the coming Spiritual world order. This is the probably the most important difference between our present bodies and the ones to come. But it’s the hardest to explain. Though we now have the Spirit resident inside of our bodies (amen! ), our bodies are still natural. But then (when the acorn sprouts out in the oak of resurrection), our bodies, themselves, will be spiritual, that is, perfectly responsive to the Spirit. I know that these are very abstract concepts. I think they have to be because we are dealing here with something unlike anything we have ever experienced or will ever experience until it happens. No eye has seen, no ear has heard, no mind has conceived what God has planned. The best illustration I can come up with is that right now the perfect software for your bodily computer is already running on it. “Holy Spirit Infinity Version.” But your bodily hardware is barely suitable to run that software. “Human Body, Adam Version.1"
Does that make sense? I hope, at least a little. We will be transformed by the plan and power of God into imperisable, glorious, powerful, supernatural, spiritual bodies. That’s something to look forward to, isn’t? And to deny it, is to deny God’s power and plan. And it would be utterly foolish. The second part of Paul’s argument here fleshes out that last change: natural to spiritual. Paul wants to take that a step further. V.44. One follows the other like a seed and then the plant. V.45. Paul is taking us back to creation. Genesis 2:7 says that Adam (the first man and the first representative of our humankind) was given the breath of life from God and became a living being, that is, a person, a soul. Now, again, that does not mean that Jesus’ resurrection was immaterial or ghostlike. It means that in His resurrection, Jesus got a transformed body that has new qualities that are even more better suited to live in sync with the Spirit–if you can imagine that! And His new body now serves as the life-giving template, model, and paradigm of our new bodies that are on the way. The comparison goes on. V.47. If you came from Adam (and all of us did) then you have the things He had after the Fall, perishable, corruptible, weak, dying, dust-formed, natural bodies (and a sin-nature, too!). But if you are in Christ (the second representative man who is starting a new humanity), then you will get what He has! A new resurrection body: imperishable, glorious, powerful, supernatural, and in perfect tune with the Spirit. Do you see that? Don’t miss this. I know that this is very abstract. That’s how Paul is in this passage. But it is glorious when you understand it. If you are in Adam, you have an “Adam-like” body (and all that goes with it). If you are in Christ, you will have a Christ-like body (and all that goes with it). This is a glorious truth. But it raises two questions with which I’ll close. #1. Are you IN the first Adam or IN the second Adam? Are you in Adam or in Christ? Are you saved? I’m asking you, “Do you belong to Jesus Christ?” Have you recognized Him as Lord and asked Him to rescue you from your sins? Because if not, all of what we’ve talked about today is not for you. You cannot expect a body like Christ’s. You can expect conscious, eternal, torment in Hell. Are you ready to die and meet your Maker? Or are you foolishly scoffing at the very idea of resurrection? Do you want a body like Christ’s that can be perfectly in-sync with the Spirit of God? Do you want perfect fellowship with God forever in a new body? You must come to Christ on His terms and join His new humanity by trusting in His death and resurrection on your behalf. And then you can expect with all certainty a glorious new resurrection body like the one Jesus has. Come to Christ, right now. Jesus Christ died, was buried, and then rose again to new life to give you new life if you will turn and trust Him. The second question is for believers and is our third and last point. Why live like dusty old Adam when you are going to be like spiritual, heavenly Christ? #2. HOW FOOLISH TO LIVE LIKE DUSTY OLD ADAM WHEN YOU ARE GOING TO BE LIKE SPIRITUAL, HEAVENLY CHRIST. That’s Paul’s point in v.49 (and you probably noticed that I think the margin reading in the NIV has it just right). Our time living like Adam should be over. Soon, the life-giving spirit called the Lord Jesus Christ is going to make us like Him. God (by His transforming plan and in all of His transforming power) is going to re-configure our bodies to be like the man from heaven. So, why don’t we live like it right now? Why don’t we live in anticipation of what we will be? Why don’t we live holy lives of purity? Why don’t we live with eternity’s values in view? Why don’t we live like we’re going to soon have indestructible bodies? Why don’t we live for the glory of God? Why don’t we practice living in-sync with the Spirit of God? Why don’t we make a break and stop living like dusty old Adam when we are going to be like spiritual, heavenly, Christ? To do anything else would be foolish. My question for you this morning is what behaviors, what attitudes, what relationships that you are caught up in right now are “dusty old Adam?” They should be on the way out. And on the way in should be the likeness of Christ. Adamlikeness on the way out. Christlikeness on the way in. Because anything less would be foolish. Why Do Tragic Accidents Happen?